"Humans have unlimited wants and limited resources." That is the fundamental idea behind scarcity and economics. You probably learned this in school. Well I happen to think that I have less wants than the next person. But when I want something, I want it without question. A few weeks ago I moved into a new home. I use the term 'new' loosely. A better term would be 'new to me'. The house is about 20 years old and in pretty good condition. The foundation is solid. The roof looks pretty good. And the house is in a really nice neighborhood. I should have been happy to move in right? Take a look at this kitchen. One glance at these pictures and you should be able to see what I'm referring to. I love to cook. LOVE to cook. I enjoy being in the kitchen. Cooking is like an art to me. 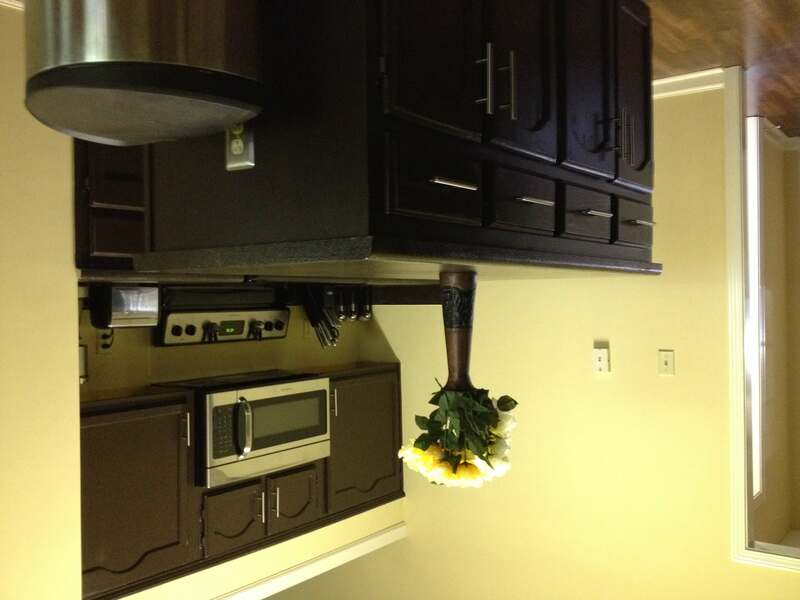 However, when I first saw that kitchen, my heart dropped. There was no way that I wanted to cook in that kitchen. I was immediately disappointed. And I quickly decided to change things up. If you're a homeowner, then you know how expensive remodeling can be. So please bear with me as I list all of my desires 'HGTV' style. I want granite countertops! And let's knock that wall out for an open kitchen concept. And oh yeah, those cabinets HAVE to go. They are way too old and outdated. I desperately NEED stainless steel appliances. Please! I voiced my desires and I started to price the changes. 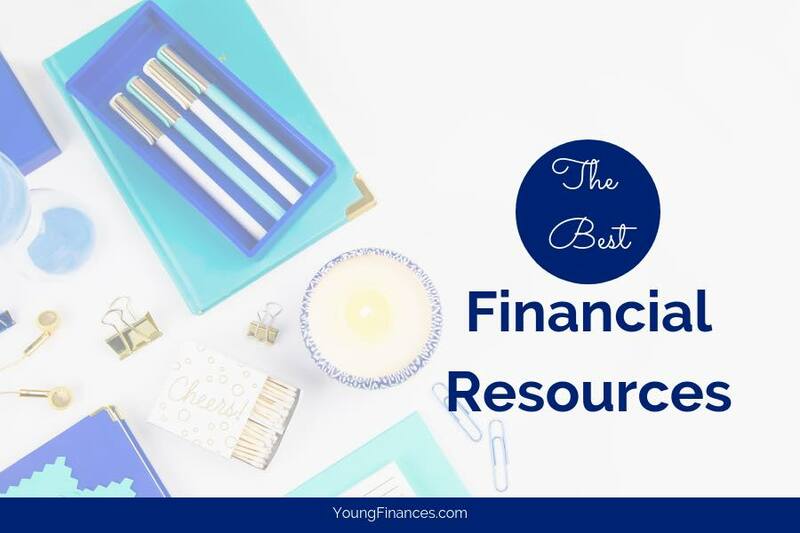 After realizing that my budget was WAY off, I made a few changes in what I had to have. Ok, maybe I don't need granite countertops. And the wall can stay. 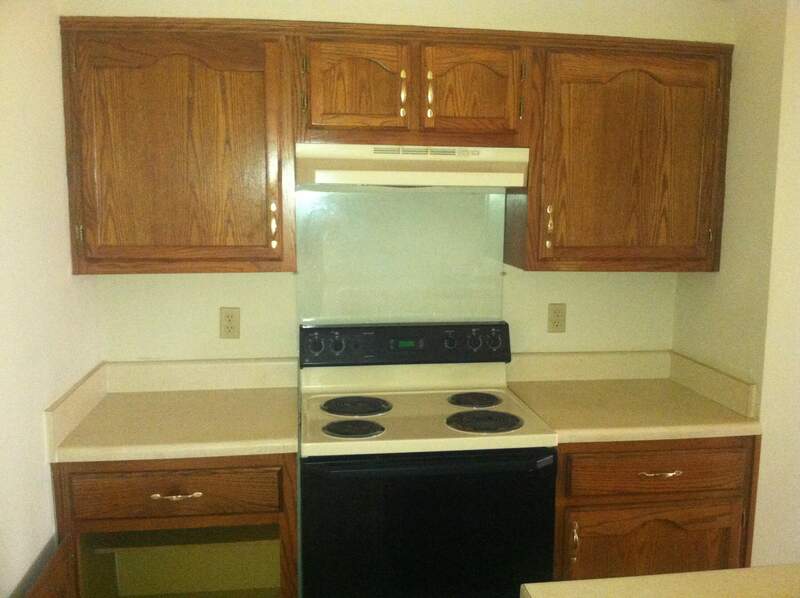 The cabinets are still ugly. Maybe a new coat of paint? 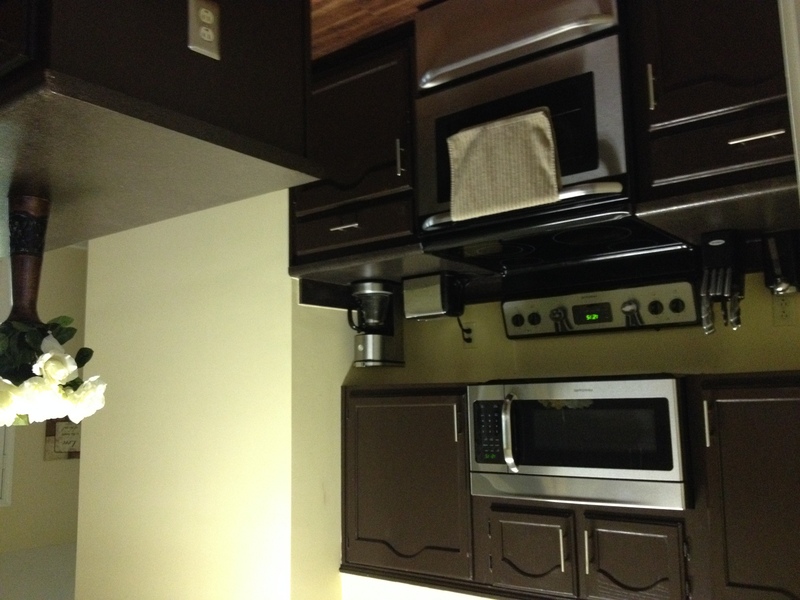 Once I came back to reality and settled on a few compromises, I began to change up the kitchen. The final look may surprise you. It sure made me happy. Here are the before, during and after pictures. The total cost came in around $3,000 and $2,000 of that was for the appliances. 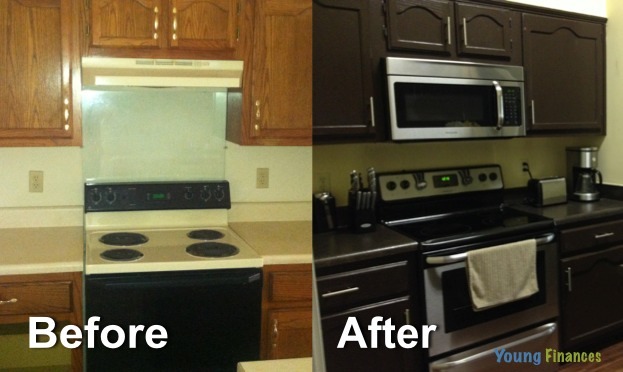 Keep reading to see how we remodeled this kitchen on a budget. These are the cabinets in a simple wooden finish. The gold handles are an eyesore, and both the cabinets and the handles are covered in years old grease and fingerprints. 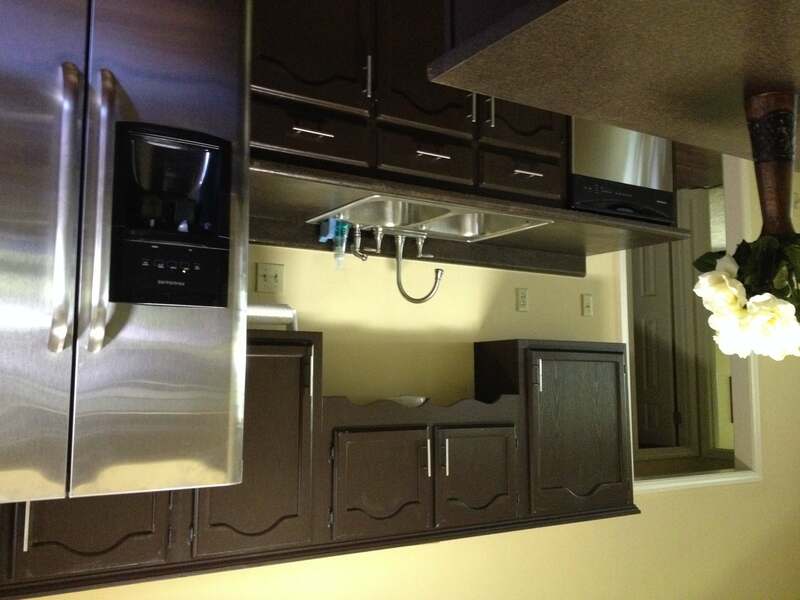 The sink is very shallow and the faucet is pretty low, meaning it would be tough to wash dishes in there. The dishwasher is also pretty old. Notice that there is no refrigerator. Lucky us. Another shot of the stove and cabinets. 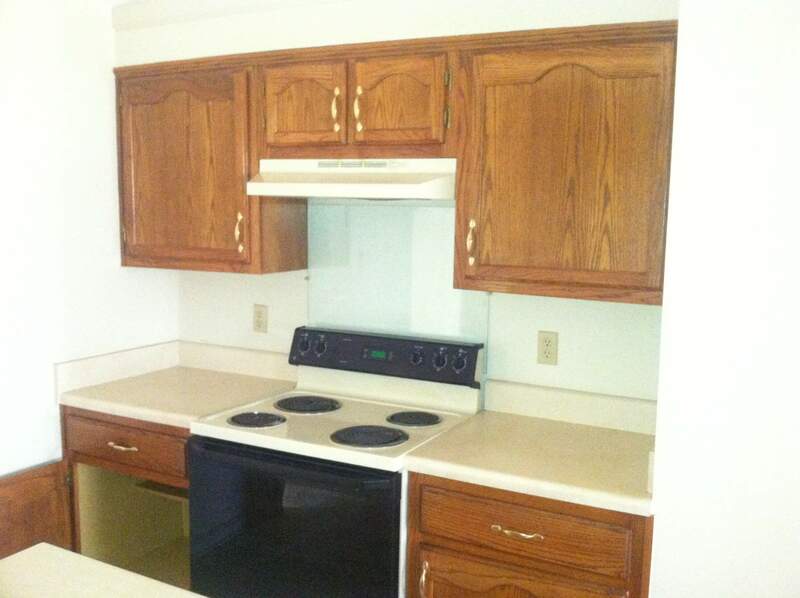 There is no microwave in this kitchen and the area over the stove has a range hood instead. Be thankful that you cannot see the 'leftovers' inside the cabinets. 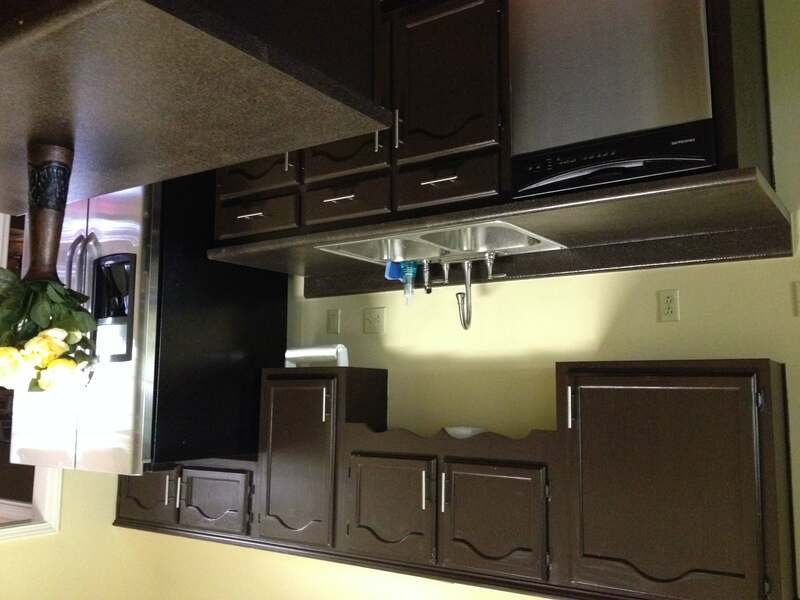 This is a pretty neat island with extra cabinet space and drawers. There are two outlets on each side of the island. This is also an opportunity to see the lovely linoleum floors. They are stained from years of use. 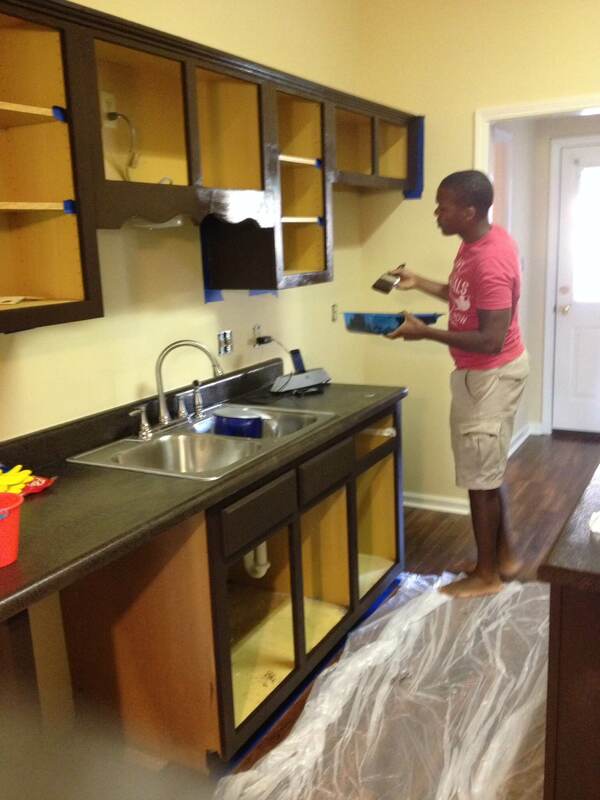 In order to keep the costs of remodeling down and shorten the time to move in, we decided to DIY the kitchen. 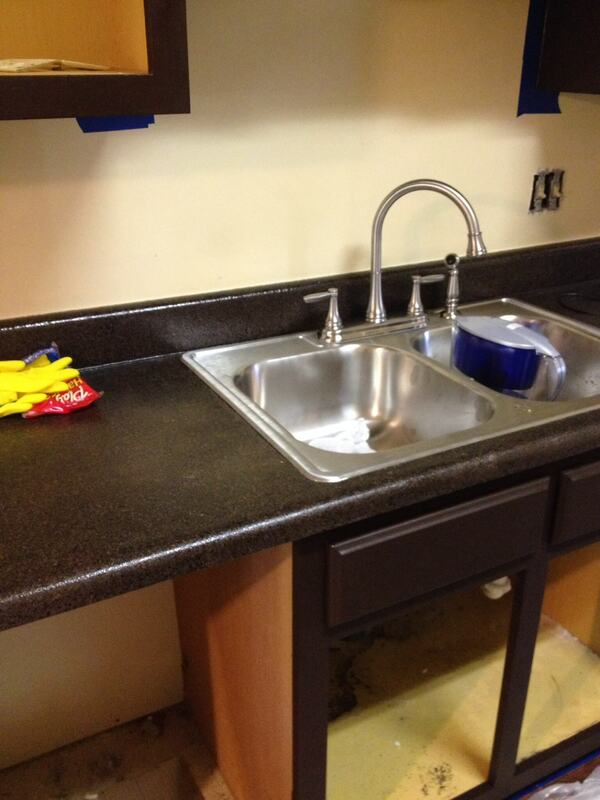 For the countertops we purchased the Rustoleum Countertop Transformations Kit in Java Chip. The kit comes with an adhesive color coat, 'granite' chips, sanding materials, and a durable clear top coat. 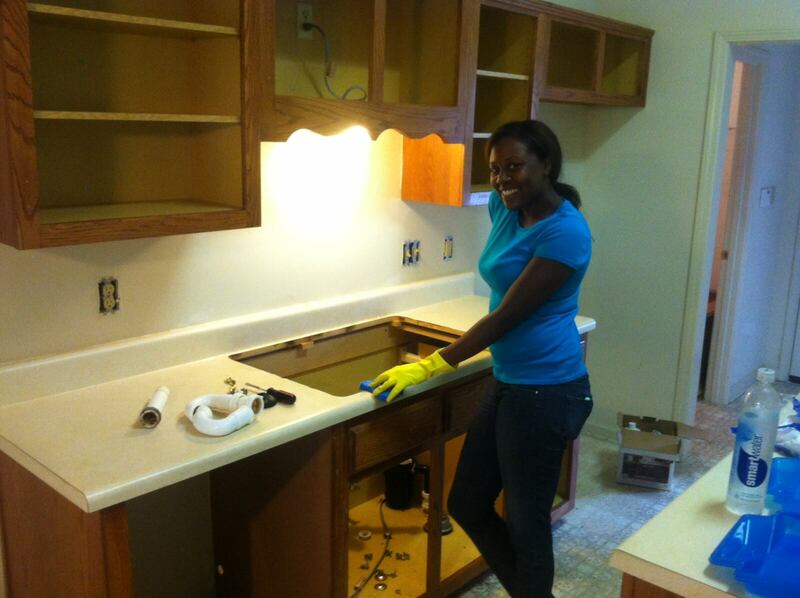 Here I am getting ready to sand the countertops and remove any extra grime. The sink has already been removed and the water shut off so we are ready to go. We've also removed the cabinet drawers and doors in preparation for the paint job which will come later. The first step involves painting on the adhesive color, in our kit it was a deep mahogany color. 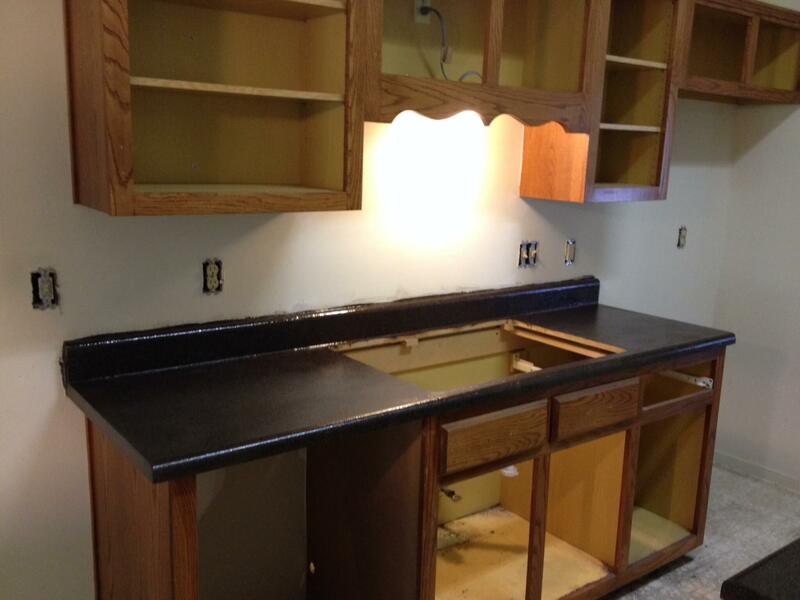 Before the adhesive can dry, a layer of granite chips is applied. These chips get EVERYWHERE. Fortunately, a shopvac can scoop up these suckers. After the granite application, the whole thing has to dry for 24 hours. 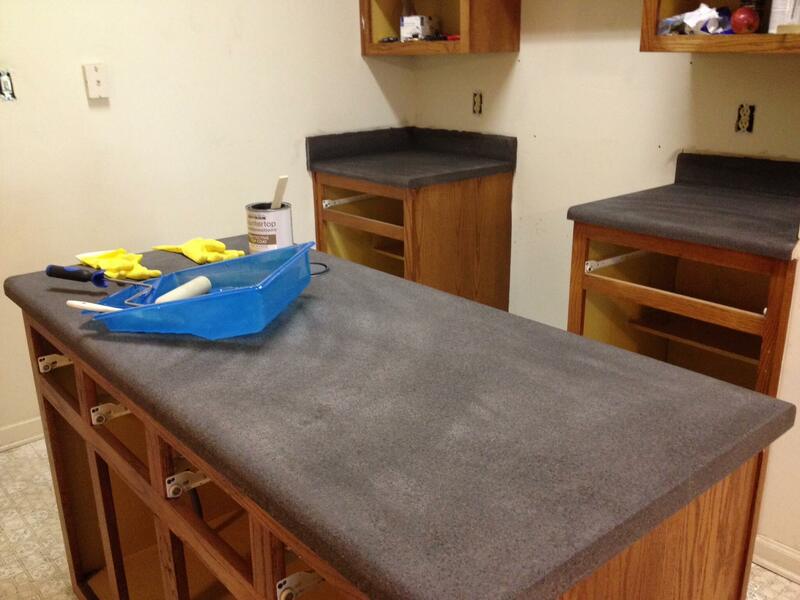 Then the countertops have to be sanded down to achieve the smooth granite feel. You'll need a lot of elbow grease. After sanding, the durable protective top coat was applied. 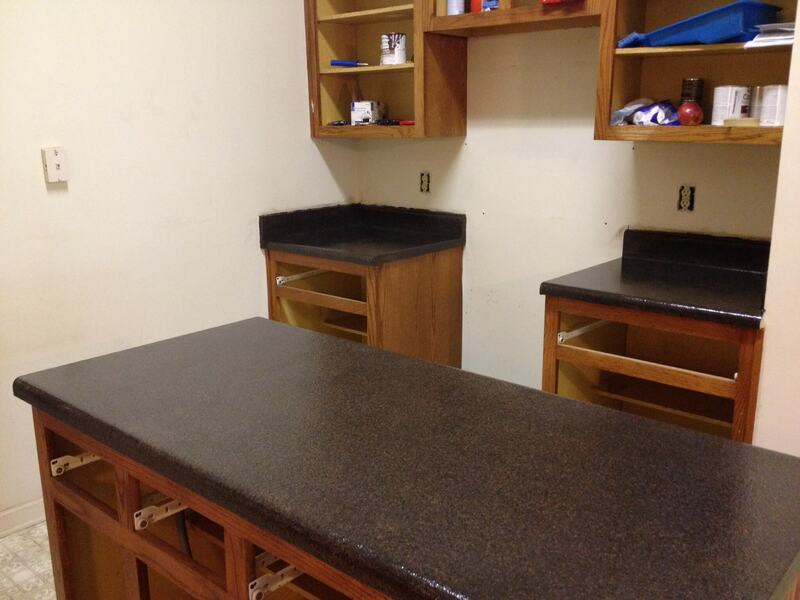 Here is a shot of the finished countertops. After a week of drying and curing they can be used. 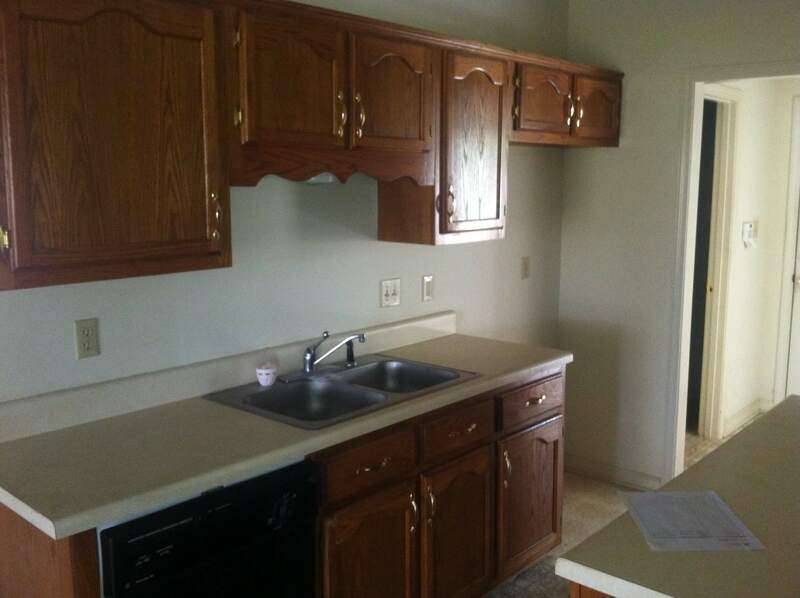 The countertops look pretty good, but those cabinets... yuck. 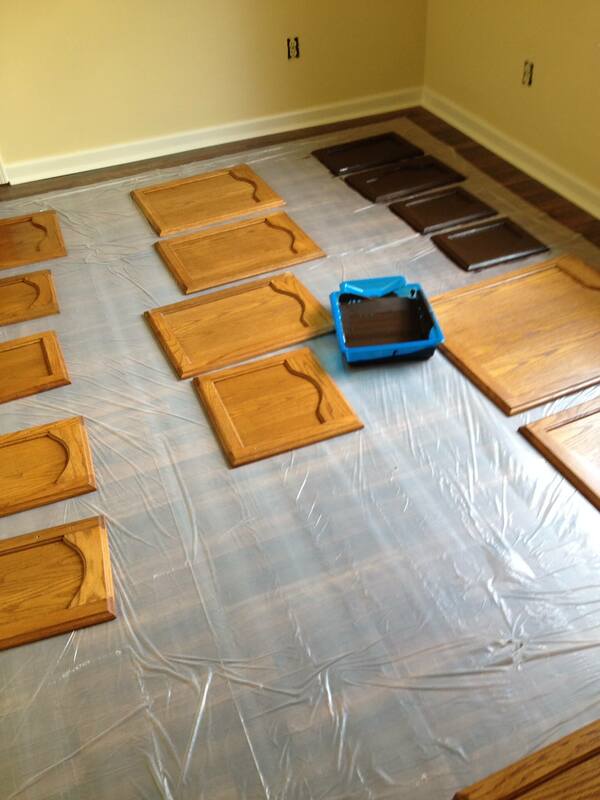 In order to update the cabinets, we decided to use the Rustoleum Cabinet Transformations kit. It included a deglosser to prep the wood, paint, optional glaze, and a clear protective coating. My back and legs were sore after bending down and leaning over to apply each coat required but the final look made it all worth it. My fiancé helping out. Each cabinet had to be coated twice with the bond color. There was an optional glaze but with darker colors it is very subtle and almost unnoticeable so we decided to skip that part and saved an entire day of dry time. Here is the new sink installed! We opted for a deeper basin along with a taller faucet and spray. The old style cabinets look much more modern with a dark coat of paint. And now for the final look! Here is the stove area. 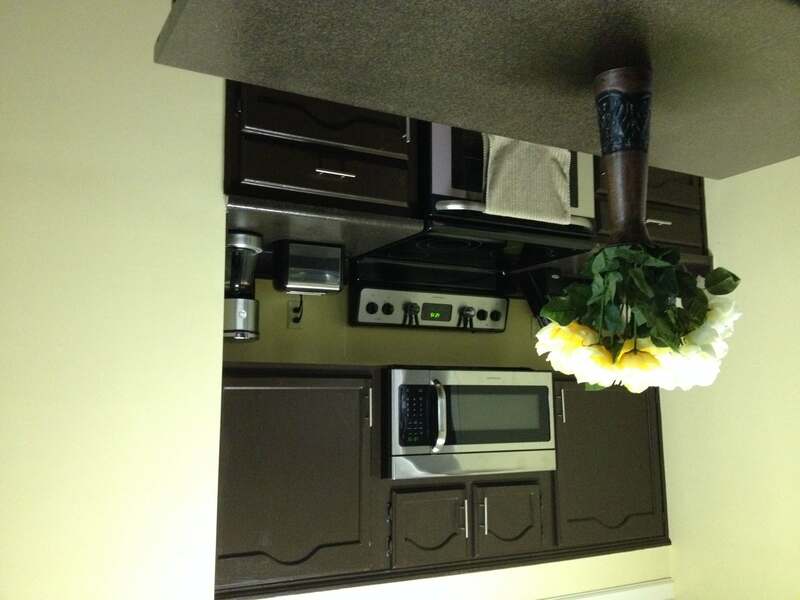 We opted for a stainless steel appliance set that included a stove, refrigerator, microwave, and dishwasher. 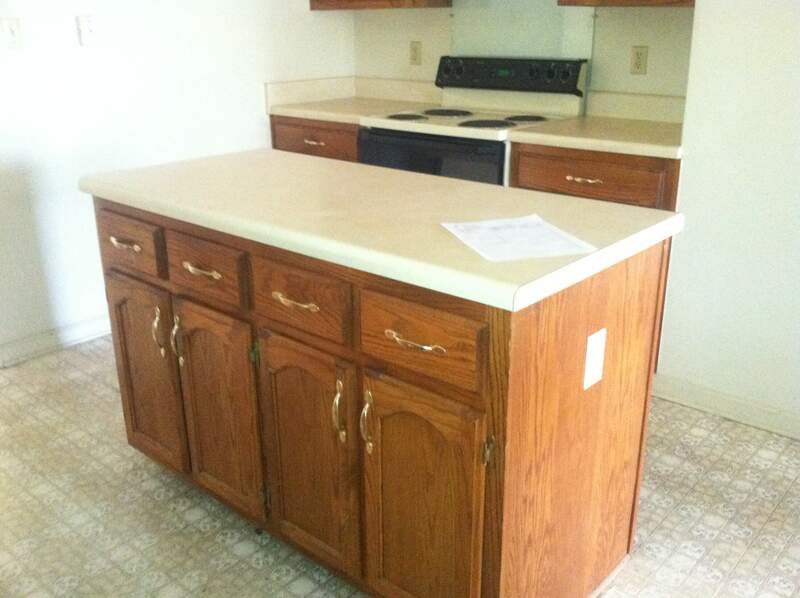 I'm so excited about my cabinets! The hardware was purchased from Amazon. We ordered brushed nickel drawer pulls/handles and bronze hinges to complete the look. The island looks much better with the updated color. I'd like to update the outlet to match the stainless steel plate covers at some point. Here is a shot with a view of the floor. And now for the total costs. I've rounded to the nearest dollar. Not too bad! I'd still like to do a backsplash against the walls so I'm budgeting about three hundred for that. But I'll wait a bit before I jump in. Do you have remodeling experience? What was your first home purchase like?